With the passage of spring comes the increased passing of potholes. That’s right, pothole season is here, to the chagrin of your tires. Some potholes are easy to avoid, other potholes are impossible to avoid. When you have the unfortunate happenstance of hitting a pothole, damage can happen to your tires, wheels, steering and suspension. 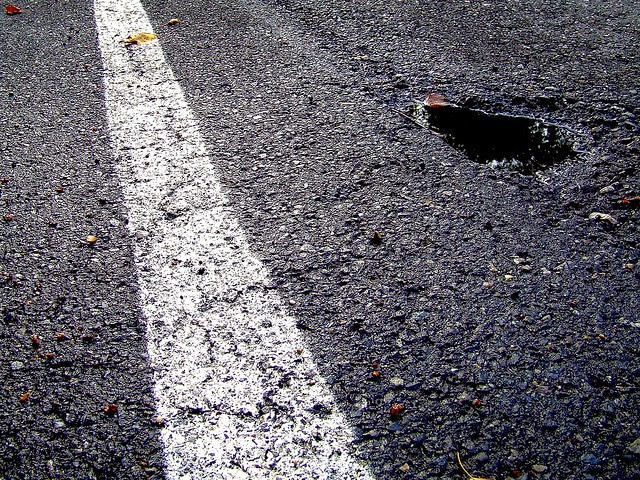 Keep reading to find out if hitting a pothole did any damage to your vehicle. After you hit a pothole, you should always check your tires. Check for bulges, blisters or other marks on the sidewall, dents in the wheel rim, and for low tire pressure. If you see any of these problems, seek to get your tires fixed or replaced. Damage to your tires significantly increase your chances of a tire blowout on the road, which are extremely dangerous and can lead to a catastrophic accident. Does your vehicle pull to one direction? Your vehicle should want to drive straight. If your vehicle starts to pull to the left or the right, that means there is a problem with your alignment. This makes your tires wear unevenly, shortens the life of your tires, and hurts your MPG. Seek a professional to get your alignment fixed. Does your vehicle bounce more than normal, sway when making turns, or is there a general loss of control since hitting the pothole? In that case, there is probably damage to your suspension or steering. Properly working suspension and steering are vital to the safety of your vehicle. Seek the help of a professional to diagnose the problem and get your vehicle back up to tip-top shape. Jiffy Lube of Indiana has your back if you hit a pothole. Our certified technicians can check your tires, alignment, suspension and steering for any problems and help get your vehicle back in safe shape for the road.